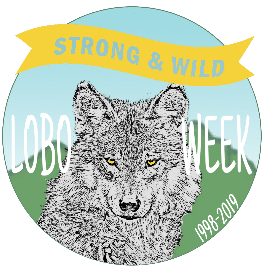 It’s that time again, y’all – #LoboWeek2019! It has been 21 years since the Mexican gray wolf (also referred to as the Lobo) was returned to the wilds of southern New Mexico and Arizona. Their persistence, despite years of mismanagement and suppression, is astounding. So this week is to them! Raise your glasses and / or mugs in their honor! To me, the lobo represents a fullness that flows beyond them. Their presence on the land depicts health and equity. Wolves are often linked to balance- keeping prey populations healthy, allowing vegetation to flourish, and thus providing habitat for other species and decreasing soil erosion. They provide us these gifts unknowingly and, I would assume, without care. They are just following their instincts, their internal nature. I am grateful to the Mexican gray wolf and all they give to the Earth. And their unwavering drive to survive is nothing if not admirable. For better or worse, I see that same drive in humans. Perhaps it is that we see ourselves in the wolf and that is one reason why white settlers have traditionally feared and oppressed them. That mentality has permeated into an institutionalized bias against them that lingers to this day. Humans account for the majority of all lobo mortalities. 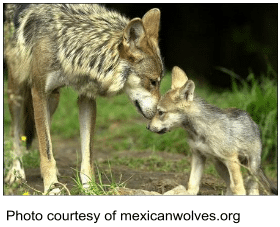 Too often, Mexican wolves are hit by cars, caught in traps, illegally poached, or lethally removed due to livestock depredations (that are often avoidable). In 2018, 21 wild Mexican wolves were found dead, a 50% increase over the next highest year for wolf mortality, which was in 2016. Many of these mortalities are still under investigation. However, the greatest threat to lobo recovery lingers beneath the surface. After being listed under the Endangered Species Act in 1976, a captive breeding program began. But the Mexican wolf was just one bad day away from extinction. Only seven individuals were able to be located in the wild. These seven wolves are the ancestors of all lobos alive today. But that makes the gene pool pretty slim. So slim that all the wild wolves today are estimated to be as closely related to each other as brother and sister. Low genetic diversity like this causes big problems in the animal kingdom. For the lobo, this means low birth rates, disease, a decreased ability to adapt to changing climates, and an overall harder time recovering. Despite these barriers, they have persisted in the wild for 21 years now. But they need help. For almost four years now, the US Fish and Wildlife Service, the agency is charge of lobo recovery, has relied exclusively on cross-fostering to increase genetic diversity. Cross-fostering is a strategy used by the Service, during which newly born pups are removed from a den and then either placed in a different den or replaced with captive-born pups. This strategy mixes up the genetics within packs. Wolves are notorious suckers for puppies (kind of like when you see a cute, chubby baby in the supermarket), so there is little risk of a “new” puppy being rejected. Cross-fostering is an effective strategy, however, some experts explain that it should not be the only strategy. Releasing captive-born, bonded family packs into the wild has shown a high level of success and a high rate of survival. This strategy also allows for lots of new genes to be added to the population at one time and is not limited by external factors, as cross-fostering is. With cross-fostering, timing is everything. The captive-born pups must be very close in age to the wild-born pups. If these litters are not born close enough in time, the cross-foster cannot happen. Cross-fostering is also limited by the number of dens found by US Fish and Wildlife Service staff. If the wolves hide their dens too well, there will not be any cross-fostering that year. Ensuring that the Service uses a variety of techniques in their plans to shepherd the lobo to recovery is imperative. At this point, it has been 204 weeks since any adult wolves were released into the wild. Please ask the US Fish and Wildlife Service to diversify their strategies in order to save the lobo from this genetic crisis. Well said! Thank you for spreading the love for Lobos this week! wildlife is beautiful life both flora and fauna. please preserve and protect all wildlife. Lobos are so beautiful! Thank you for this post! Wölfe erfüllen eine wichtige Funktion im Ökosystem. Er wird auch als Gesundheitspolizei bezeichnet, da er häufig kranke und schwache Tiere frisst und somit den Bestand seiner ” Beutetiere ” gesund hält. Durch Bejagungen wird dieses System nur nachhaltig gestört. I don’t think people understand EXTINCT IS FOREVER! I fully support you and our Lobos- and continue to advocate for their survival-thank you for these thoughtful comments on behalf of Lobos.